Dimensions: 13cm x 8cm with a 8cm x 3cm handle. Dispatched by Personalised Gift Ideas Usually Within 3-5 Working Days. 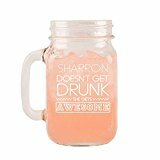 This personalised and engraved mason jar is a perfect gift for any woman who likes a drink. It features a fun and quirky design with the phrase “(name) doesn’t get drunk, she gets awesome”. It’s personalised with the recipient’s first name at the top of the glass – ideal for knowing what drink is hers. This fun glass is perfect for cold drinks and cocktails. It’s an ideal present for their birthday, Christmas, or any occasion that deserves a drink! The mason jar has a handle, and is engraved in house. Personalisation guidelines: 1. Recipient’s First Name. Dimensions: Approx. 13x8cm, handle approx. 8x3cm. Please note the mason jar is NOT suitable for hot drinks or preserving food. How to personalise: Use “GIFT MESSAGE” AT CHECKOUT to supply us with your personalisation details. DELIVERY: Usually dispatched within 3-5 working days.